Who am I then? 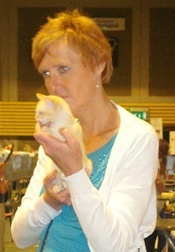 My name is Irene Antonsen, I live with all my cats in Sandefjord, Norway where I also grew up. I got my first burmese in 2002 after having fallen in love with a lilac female at a show. After reading all the wonderful caracteristics of the breed I could hardly believe all of it could be true, and I had to get to know this breed for myself!! Chocolate (N) Thorelin's Unique Lady was my first female burmese, and she won Best in show at her very first show just 3 months old. There are not many serious burmese breeders in Norway, and we needed some new burmese genes to get the breed going again. EC Fioric Clarissa and Fioric Ayers Rock came all the way from Australia in 2004 to make babies in Norway, and then GIC Roemah Koetjing Zwiebertje Zolo arrived from Holland in 2007. My Clarissa won the title "Best breeding female of the year 2007" in category 3, and has really done a lot for the breed in Norway. In 2012 I went to visit Linda Dooremalen in Holland and came home with a lovely baby girl, lilac tortie Unica. Then in 2013 arrived the most valuable transport from Australia ever when Cassan, Sequin and Blaze were trusted me from Dianne Dolman of cattery Brookside in Adelaide. The burmese breed is still a very small breed in Norway but we are doing our best to make sure this delightful breed has a future in Norway.